SANTA CRUZ, Calif. -- Heavy winds and falling tree limbs has downed numerous power poles in Santa Clara, Santa Cruz and Monterey counties this morning, leaving 78,700 PG&E customers without power, according to PG&E officials. Two transmission poles on the Central Coast were brought down and a PG&E substation in Salinas, where 31,200 people are currently experiencing an outage, was also affected. Winds as fast as 69 mph were reported at the Salinas airport starting at 5:30 a.m., PG&E spokeswoman Mayra Tostado said. PG&E crews from other services areas are responding to the South Bay and Central Coast to help restore power, but in many cases downed vegetation is making it difficult for crews to access sites and complete repairs. 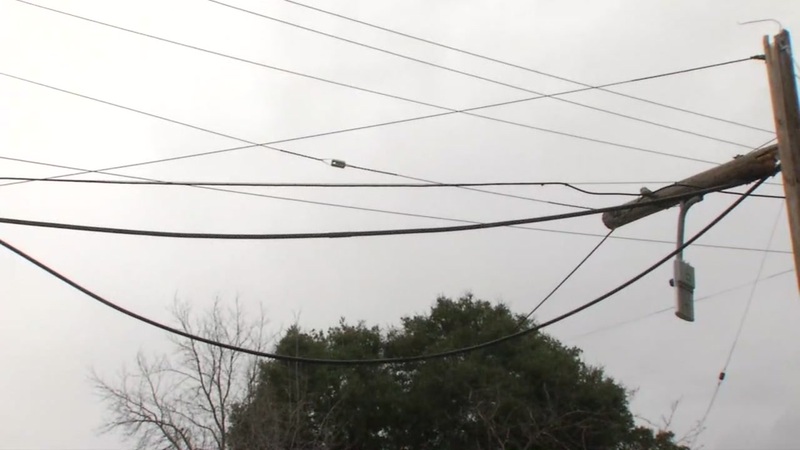 Officials expect more outages to crop up throughout the day as heavy winds continue to blow in the area, Tostado said. Residents who come across downed lines or power poles should stay away and call 911 immediately. "We are facing very dangerous situations," Tostado said. Some 43,430 Santa Clara County residents are experiencing outages, including 23,067 in San Jose, 9,740 in Morgan Hill and 6,622 in Gilroy. The outage includes Mineta San Jose International Airport. The airport-wide outage started at 9:55 a.m., airport spokeswoman Rosemary Barnes said, adding that wind gusts at the airport had been reported to be as fast as 45 mph. Southwest Airlines had already canceled 17 flights due to weather in Southern California today. The airport is fully operational on generator power, but some airlines may experience delays. Not far from the airport, Interstate Highway 880 is closed in both directions near Bascom Avenue due to downed power lines across the freeway, according to fire officials.